Tumblr’s user base has doubled to 420 million since the platform was acquired by Yahoo last year, and the number of blogs has grown to 206 million, with over 900 posts generated every second. Another telling figure for Tumblr’s success is the average time spent on the site— according to Marissa Mayer, CEO of Tumblr’s parent company, Yahoo, the browsing time now averages 28 minutes per session. Compare that with the millennials’ social network darling, Instagram, where users spend 21 minutes a day, and you’ve got a sense of why you need to be thinking about how to make the most of Tumblr for your business. Tumblr is a microblogging platform, known for short, multimedia posts that users can create using original content, or reblog from a different Tumblr blog. Tumblr blogs are a popular choice for the content marketing platform, because of their scheduling capacity and high engagement potential. Your brand’s Tumblr blog not only needs to attract readers, but the content of the blog should also be engaging enough for them to spend the entire half-hour average on your blog. Oh, and joining your efforts with your brand’s Instagram account helps. In our last blog post dedicated to using Tumblr for business, we discussed the basics of positioning your brand’s blog to fit the best Tumblr practices. Now that you’re familiar with the difference between an Ask Box and a Submit button, it’s time to make Tumblr a more essential part of your content curation strategy. Here are a few ways you can increase online visibility for your brand through a Tumblr blog. If you are using Tumblr as your primary content marketing platform, you should treat it as your primary blog and dedicate time and effort to create a content calendar. It may even be worth it to create a custom domain name for your primary blog. This allows you to have more than one blog for your business—after all, Tumblr blogs are easy to create and even easier to use, and there are many possibilities for Tumblr that may not fit into your official page. For example, if your brand is planning a promotional campaign or a contest, you can easily create a Tumblr blog to keep track of all the entries. If your campaign has an official hashtag, you can set up the blog to publish appropriately tagged Instagram photos and Tweets (read the steps for connecting Twitter and Tumblr). But before you start, read Tumblr’s contest guidelines to ensure you don’t accidentally break any rules. Tumblr, like Instagram, has a much more casual overall tone as a network. Our post discussing basic tips for using Tumblr for business brought you up to speed on what kind of content performs well—a few examples being GIFs, memes, and funny photo sets. It’s important not to force this casual tone, with the risk of coming off insincere. Instead, think of the aspect of your brand that fits this fun visual network. 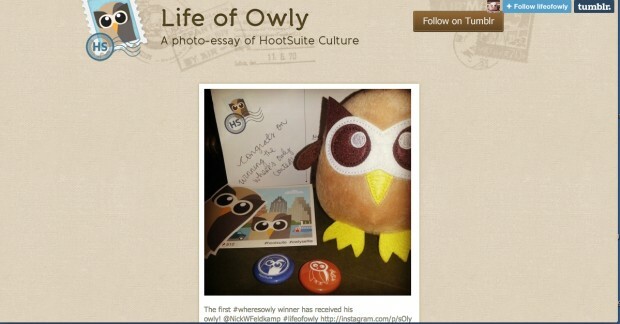 For Hootsuite, it’s the lovable Owly—we have a page dedicated exclusively to the travels and adventures of our mascot. If this piece of advice sounds familiar, good job—you must have paid attention when we wrote about social media profile mission statements, where we assigned Instagram to be the culture crusader among the social networks managed by your brand. Tumblr and Instagram are highly complementary to one another due to their primarily visual nature: Instagram photos look great on Tumblr’s blogroll; both networks use tags to discover similar content; and Tumblr makes it easier to share Instagram photos by reblogging them. In order to connect your brand’s Instagram account to Tumblr, you can select Tumblr in the “Share To” screen on Instagram, or use this handy IFTTT recipe. Using the latter tool, you can choose to cross-post all your Instagram photos, but my advice would be to choose a hashtag that signals IFTTT to pick up only pictures containing a particular hashtag. For example, the #HootsuiteLife blog where me and my fellow owls share all things Hootsuite only posts Instagram photos tagged with the appropriate phrase. A culture-centric hashtag is a great way to make your employees into brand advocates by simply encouraging them to share their favourite moments about their job. This gives your customers an intimate behind-the-scenes look at the company, and attracts potential employees who share the same values and fit into your company culture. One of the advantages of using a Tumblr blog as your content marketing platform is the easy indicator of your blog’s success: you can judge how well your audience is responding to your posts by how many Reblogs and Likes they receive, and how many followers you gain or lose on a following week. For a deeper analysis, you can track the performance of your blog by setting up a Google Analytics page for Tumblr. The Analytics page can inform you on the number of users visiting your blog and how often they visit, the popular referral sources for your blog, and keywords that help direct traffic to your content. Pay close attention to what type of content attracts the most readers for your blog: is it reblogged content, content generated by your customers, or content created by your brand specifically for Tumblr? Knowing what your readers prefer will help you adjust your strategy to help drive more traffic in the future. Tumblr tags are a great tool to help you discover the content curation strategy of other businesses. You can take a look at what other businesses are doing on their blogs by browsing the right directory on the Tumblr+Brands page. You can connect with them by liking or reblogging posts from their blog—just be mindful of the content you choose to place on your own business’s page, there’s a world of a difference between appearing industry-aware and accidentally reblogging a post promoting your competitor. In order to keep track of your own blog, monitor other Tumblr accounts you follow, and share your blog posts on other social networks, you can install the free Tumblr app for Hootsuite. Finally, once you feel confident about your knowledge of Tumblr as a publishing platform, consider it as an advertising method. Tumblr has a few advantages over other social networks when it comes to social ads: first, its sponsored posts are featured in owned Yahoo properties, including its massive search engine. This means exposure across several platforms for the price of only one, and it may be worth your while: Adobe Digital Index Mobile Benchmark Report identified Tumblr as having the highest revenue-per-visit referral on smartphones and tablet, placing the network ahead of Facebook, Twitter and Pinterest when it comes to its mobile referral power. Tumblr also recently launched video ads that automatically start playing once the user scrolls to them on their Dashboard. If your brand does not have a dedicated video team, or can’t justify investing resources into maintaining a YouTube channel for promotion, Tumblr video ads offer a good alternative. Finally, earlier this year Tumblr partnered with a photo analytics brand Ditto Labs, which analyzes social media photos for brand-related data. Given that photos make up a large portion of Tumblr’s overall content library (and, hopefully, your own Tumblr blog! ), this can inform your brand on the average sentiment surrounding your company. And while no official integration plans have been reported for Tumblr ads and photo analysis, it’s something to consider when you engage with your customers. 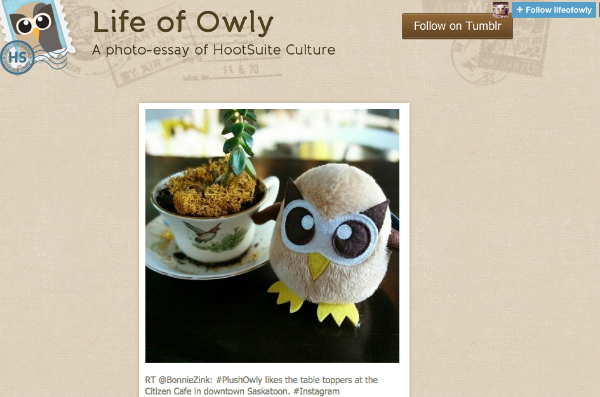 Hootsuite’s Tumblr app makes it easier to use Tumblr for business. Try Hootsuite for free.